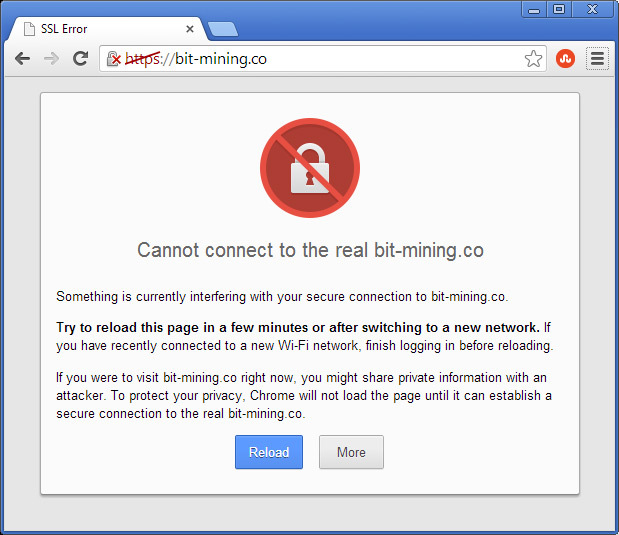 The Bit Mining service for Litecoin and Bitcoin cloud mining is kind of down yet again, not long since they had another serious issue. Last week the service was apparently been hacked, but it was brought back online and this week the people behind it were trying to fix things and get everything back to normal and about a week now and it still is not fully back to normal. And while they almost did it, now the website is not opening again, giving an error about their SSL certificate not being valid. And this has been going on for more than a day now, though we have notified the support as probably other users did so already and they are apparently looking into the problem. If you disable the certificate validity check in the browser you can apparently login on the website, however this does pose a risk for your security and you should enable the validity check for SSL certificates after that. The Bit Mining service has been available for a while now, but apparently things are getting out of their control. We just recently started testing the service and more specifically the LTC cloud mining that has been added not so long ago, but our experience so far with the service is more than unsatisfactory. Lots of downtime, problems and things that need more polishing, and along all that the the price drop of the hashrate, making it really not worth to invest into more hashrate. In fact we do plan to sell our 100 KHS of LTC cloud mining hashrate and stop using it and we would recommend you do the same thing if you have hasrate there, and when everything is back to normal we may consider trying the service again. Investing in cloud mining hashrate there for the moment is also not recommended, not until the issues they are having are completely resolved. Issues like that are really killing the users trust in services offering cloud mining hashrate as an alternative to using hardware miners, we’ll keep you updated on how things progress.